To activate the RSS feature, go to the Settings - RSS section. A feed can be selected by left-clicking it. Multiple feeds can be selected by holding down the CTRL key when clicking, which will allow a cumulative selection. The divider between the upper view and lower property tabs can be dragged up and down by holding the left mouse button down. The information tabs at the bottom of the view (if enabled) will show data for a feed when one (and only one) is selected. Visit the RSS Properties help page for more details. Pressing this button opens the RSS Add New Feed window. These buttons will set the selected feed(s)s to active / inactive mode. When a feed is active, it will automatically refresh itself on a timed interval. This button will remove the selected feeds. This button will open a new RSS Properties window for each feed selected. This window will contain the same property-tabs that are seen at the bottom of this view. Pressing this button will present a drop-down menu with many options to customize the view. You may add sub-groups containing feed URLs or feed items, as well as adjust the way these sub-groups are sorted and organized. 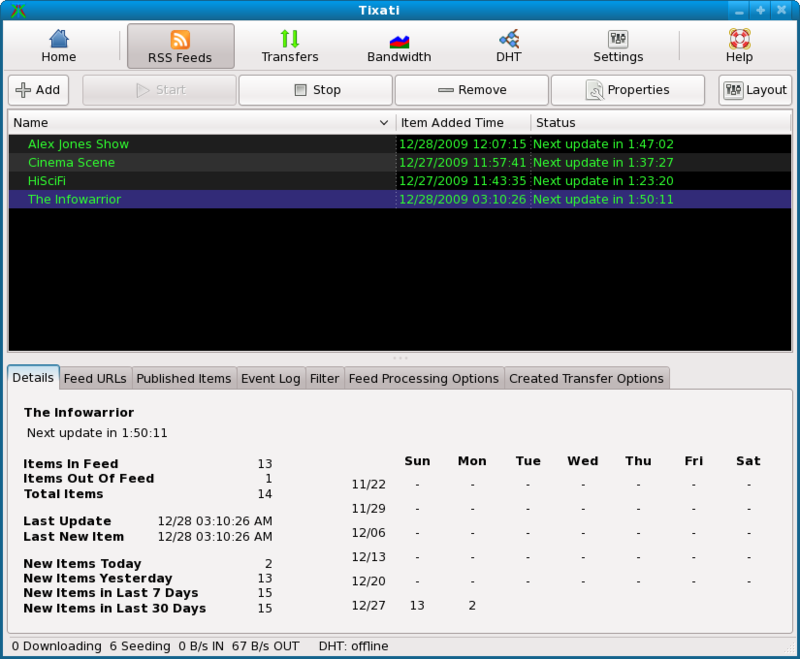 These menu items will set the selected feed(s)s to active / inactive mode. When a feed is active, it will automatically refresh itself on a timed interval. This menu item will force the feed to refresh it's list of items from the server. This menu item will remove the selected feeds. This menu item will open a new RSS Properties window for each feed selected. This window will contain the same property-tabs that are seen at the bottom of this view.